One thing was absent for seven days during my recent trip to in Melbourne. Catching up with family and friends is always special. We explored some lovely settings. We consumed large quantities of excellent food and drink. But my mind and body needed two-wheeled therapy. I was probably at the point where I would happily have ridden a unicycle into a hurricane if it meant I was on wheels. Fortunately that wasn’t necessary. 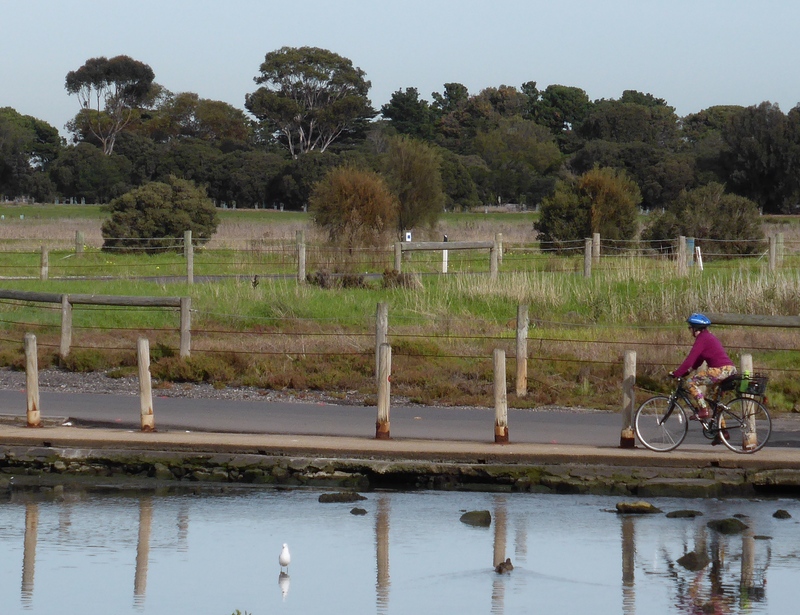 Instead I closed the Melbourne leg of our holiday with the all the elements of a perfect cycling day out. Great company, exploration of a whole new place to ride, excellent cycling infrastructure and the weather did its job too. Our ride party almost deserves a story in itself. While we were at Velo-city in Adelaide I met the mega-enthusiastic Tina McCarthy from Wheel Women in Melbourne who was buzzing about taking in the whole Velo-city experience and enthusing about her work to get more women riding. 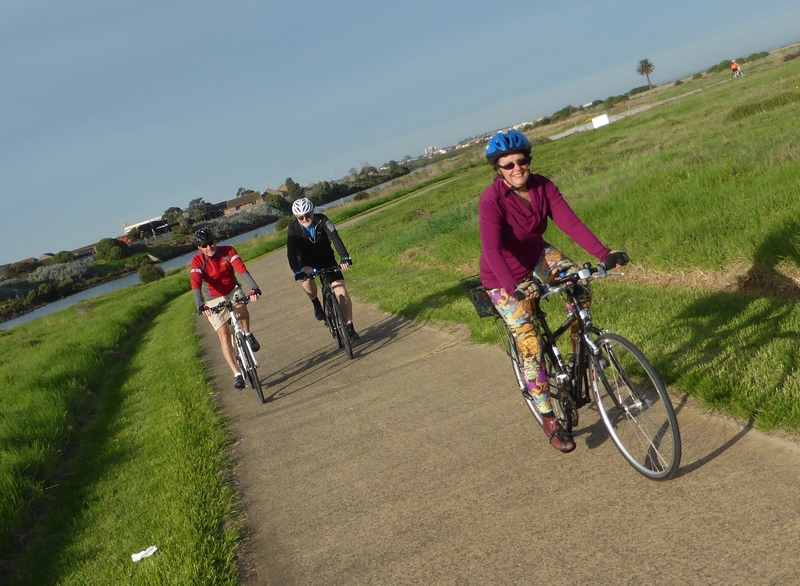 She invited us to come and ride when we were in Melbourne. I must admit at that stage I wasn’t sure how that would be possible, but her enthusiasm was infectious. But the possibility took on a new dimension a couple of days later when a magical “small world” moment occurred. When she returned to Melbourne Tina caught up with her friend and neighbour Susan who asked if she had met “I do not despair” Kevin in Adelaide, to which she replied “no”. It took them a few minutes to work out that ECF Kevin who had met Tina was indeed the same Kevin that was planning to meet Susan in Melbourne, my friend from college days in Durham, England. You could have knocked me down with a feather when they both emailed me within ten minutes of that conversation. How incredible is the world if two people who come from such separate times and places in my life not only live a couple of streets apart but actually know each other? 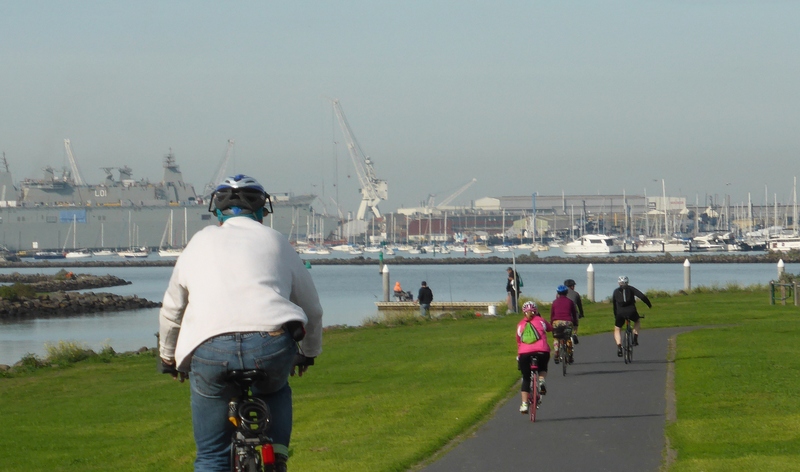 I mean everything was conspiring to make us go cycling – how could I possibly refuse? 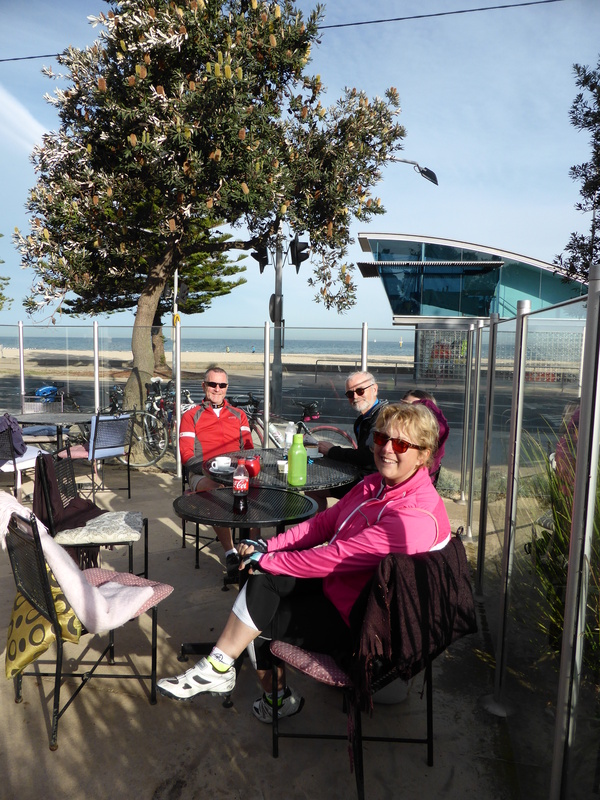 Along with Susan and her partner Neil we were joined by Danish friend and ECF board member Jens-Loft Rasmussen who had arrived in Melbourne as part of his post Velo-city Australian holiday. Tina’s friend Peter who is a retired head teacher with a great knowledge and passion for the local area acted as tour guide so we had a perfect collection of friends old and new. 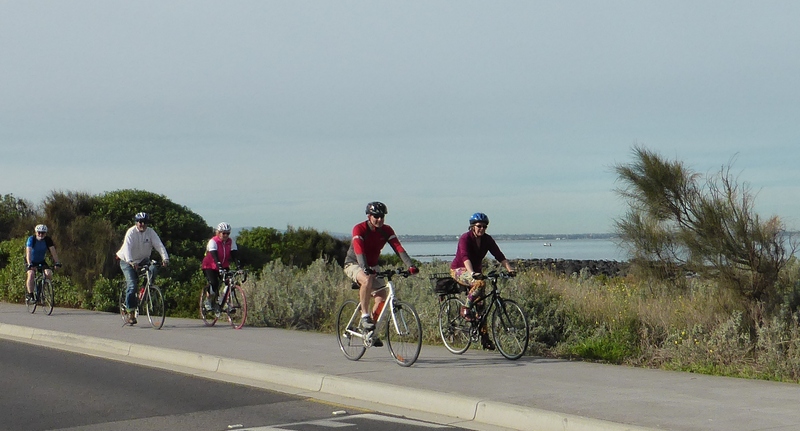 On an almost traffic free route we had the space, time and tranquillity to ride, learn about the environment and history of the area, chat, catch up, share ideas and of course fix the world. That’s my kind of cycling group. The route itself helped make that possible. 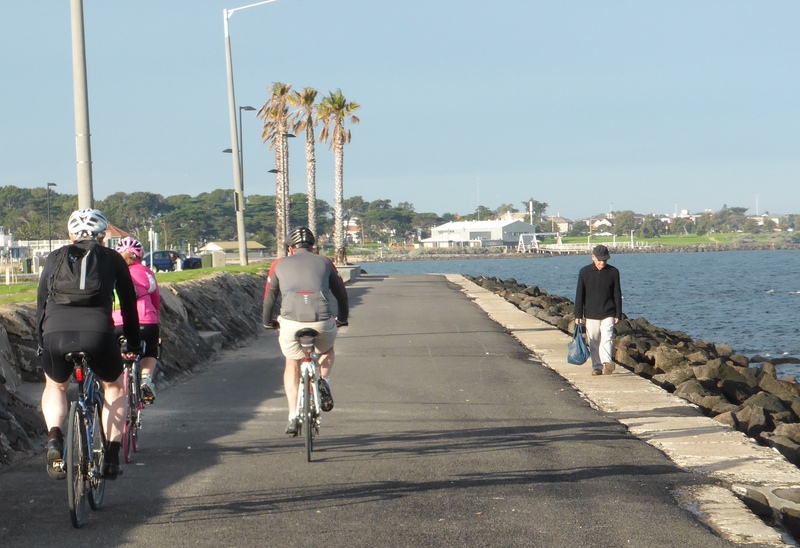 We rode about 60km out and back on almost entirely flat cycle paths from the Melbourne suburb of Kensington, alongside the Maribyrnong and Yarra Rivers to the sea and then around the foreshore of Willamstown and Altona to a high viewing point on reclaimed land called 100 Steps of Federation which gave great views across the bay. 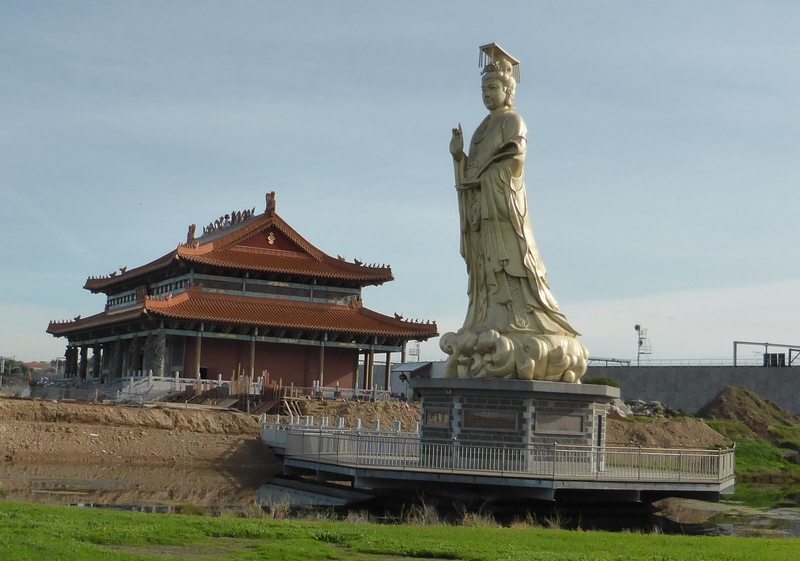 Peter had a great knowledge about the area and was also very keen to show us that it was a place of beauty and history. I get the impression he wasn’t at all surprised when I told him that I had never been there when I lived in Melbourne. In the past the areas to the west of the Bay were rather looked down on by the inhabitants of the centre and east, being considered a bit industrial, grimy and inhabited by immigrants. Of course old prejudices live long and often they are completely outdated by events. 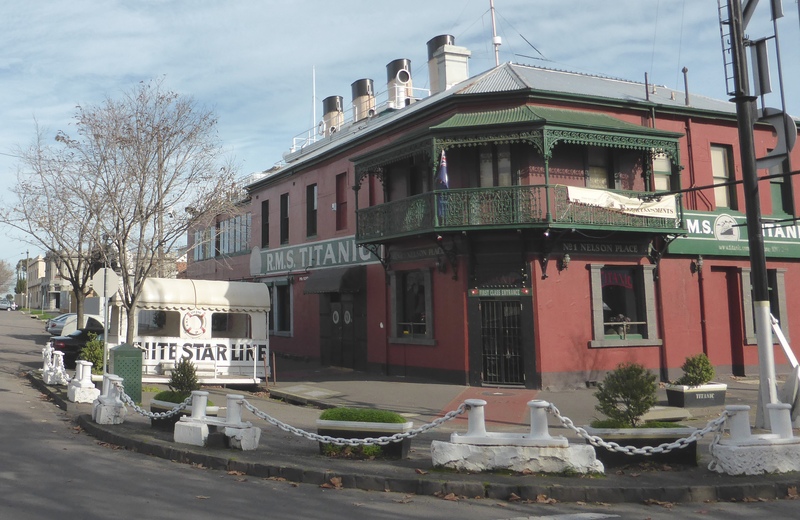 Yes there is a port and industrial heritage round the mouth of the river Yarra and in Williamstown but now much of that is worth preserving and developing while the waterside houses are increasingly in demand for their spectacular views across the bay and towards the city. 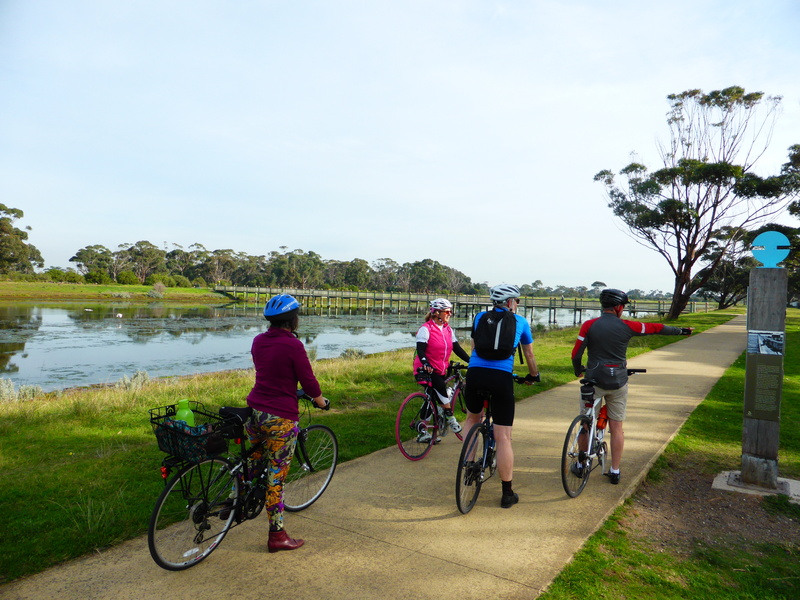 And once we reached Point Gellibrand we picked up a shared use cycle path that hugged the foreshore and ran through an almost continuous line of parks, marshland, creeks and other green infrastructure that continued for kilometre after kilometre around the coast. Where property development intruded it seems a good job is being done maintaining the balance of environment and human intervention because the lagoons and green spaces are being kept as a green band facing the sea and they teemed with bird life. 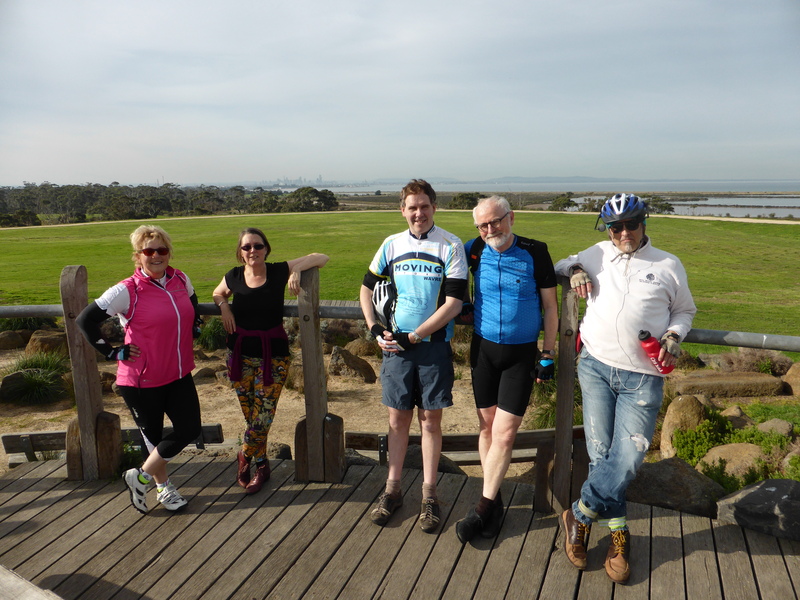 After Altona’s traditional seaside and beach we rode up to the top of the 100 Steps viewpoint to take in a huge vista around the bay. Only when Peter explained did we realise that 100 steps is the covering mound to a former landfill site, typical of the history of the area as “waste land” fit only for the birds and now desirable open space. He reported that just down the coast is a gated new development linked to a Jack Nicklaus designed golf course, the sort of exclusive development that would have been inconceivable in this area just a few years ago. 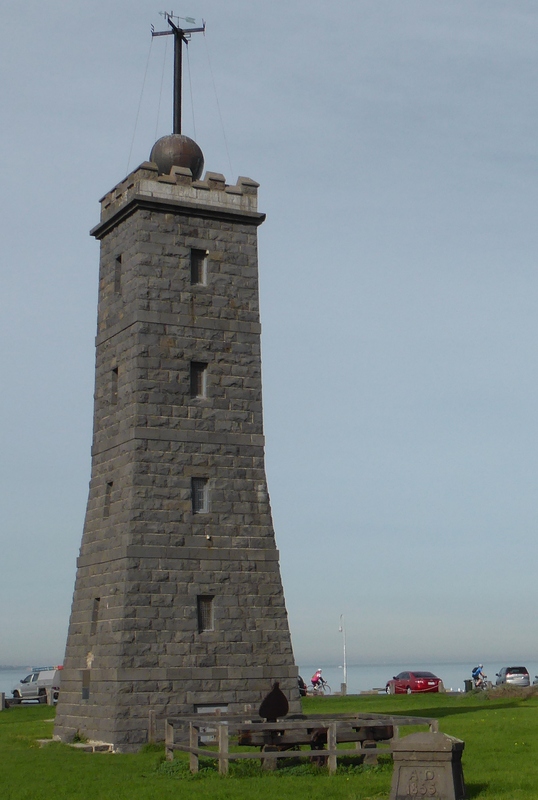 From the top of 100 Steps we retraced to Altona beach for an al fresco lunch and then wound our way back along the same route in a sharp, bright low afternoon sun that makes it inconceivable for a north European that this is the beginning of winter. Only the shortness of the days and the length of the shadows is a real give away because the temperature was close to 20 degrees all day. 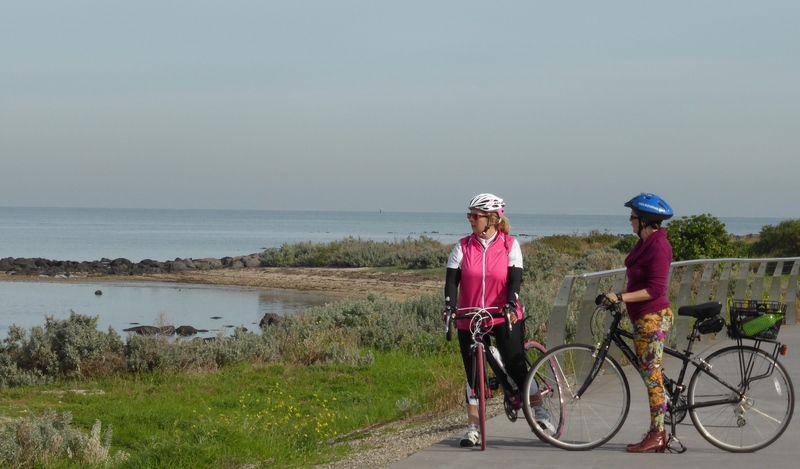 Tina uses this route regularly for her Wheel Women rides which introduce new women cyclists to gentle cycle touring rides so they can build up confidence on two wheels. 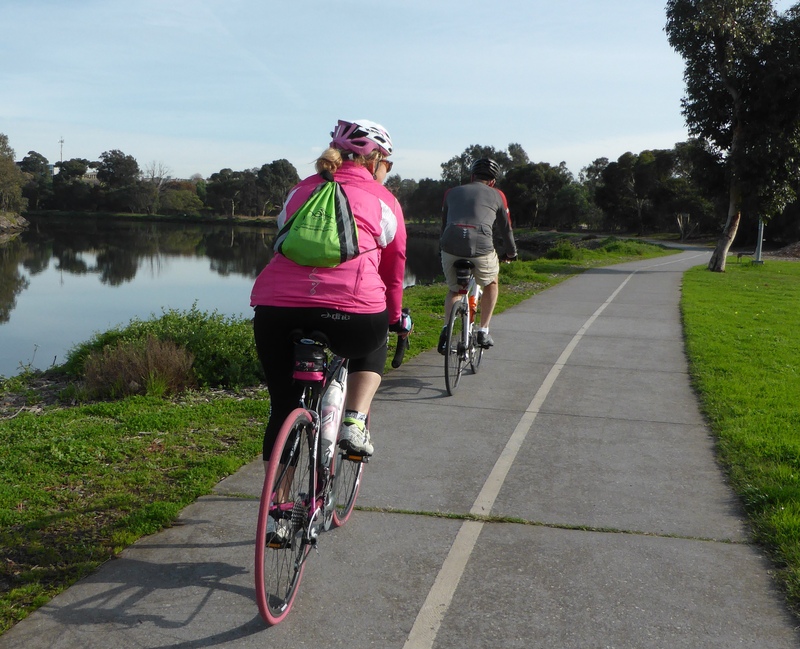 The routes are flat, mostly traffic free and provide the essential coffee shops around which Melbourne life seems to revolve. She also provides help with cycle training and bike maintenance course for beginners and takes the new starters down to quiet areas along this route for their riding lessons. All over the world I keep meeting amazing entrepreneurs who are finding ways to turn their passion for cycling into business opportunities. Riding and chatting with Tina it is clear she so much a member of our world-wide cycling family, just so committed to getting people riding that she will do most of her activities for love, she is just trying to find a way of making it become a living too, at least covering her costs. With this as her setting it is no wonder her women are having a great time and her business is steadily growing. I hope she does really well, she really was a great host and we had a very special day out with her and Peter as our guides. Thanks Tina! 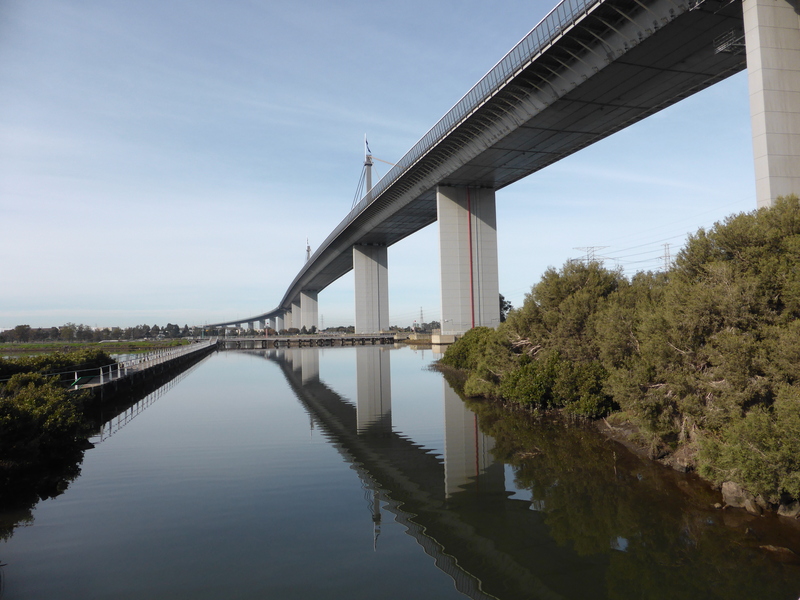 This entry was posted in Countries, Musings, Social, Travel and tagged Australia, cycling, Melbourne, photography, Touring, Travel by kevinmayne. Bookmark the permalink. 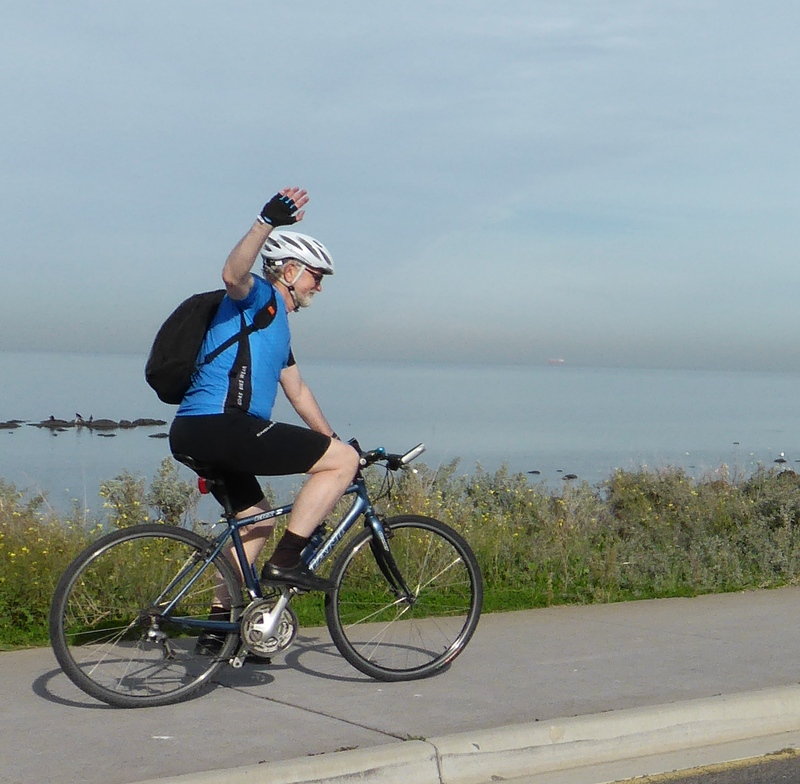 Glad you enjoyed the ride and this part of Melbourne Kevin. Great photos. There are many other interesting riding routes out west so please come an enjoy again. P.S. 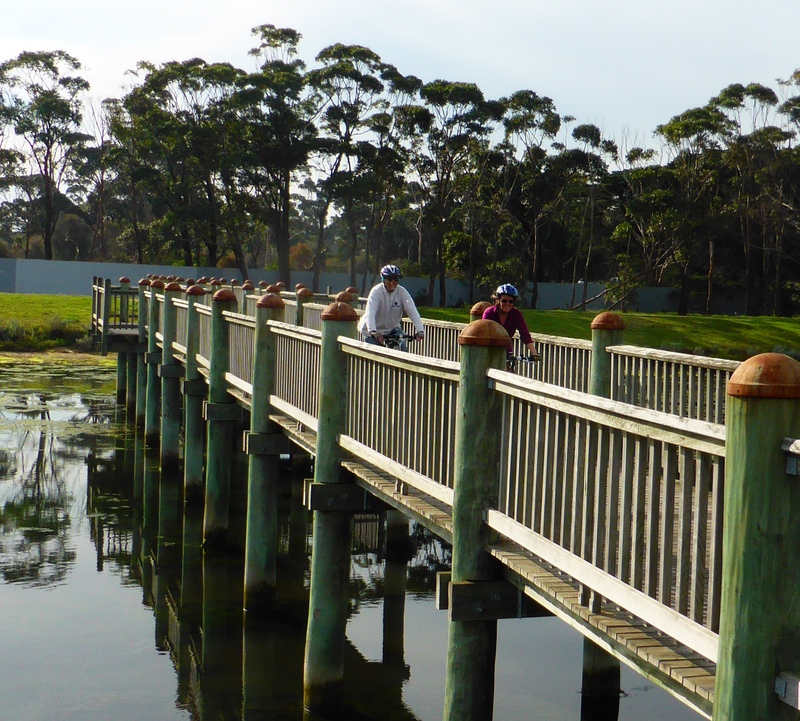 I think Greg Norman (an Aussie) designed the Sanctuary Lakes golf course.